Sayacmarca was discovered by Hiram Bingham when he followed an Inca road across the hills from Machu Picchu, but the name Sayacmarca was coined by the Fejos expedition in the 1940s. Bingham's half-Spanish, half-Quechua name for these ruins, Cedrobamba (Cedar Plain), actually refers to the elongated spur on which all the sites close to Machu Picchu are built. 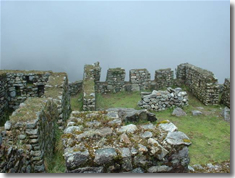 Fejos changed the name to Inaccessible Town, a name that describes the position of the ruins perfectly, protected as they are on three sides by a precipice that descends to the dense jungle of the valley of the river Aobamba below. The dramatic setting of Sayacmarca was no accident as it's built at a fork in the old Inca road. Today's Inca Trail follows one fork to Machu Picchu, but the other fork descends to the bottom of the Aobamba valley. From here it's been traced up the other side of the valley, where it passes through some ruins called Llactapata, and then descends to the Santa Teresa river. From the river it climbs again to more ruins, Ochopata, about 15km from Sayacmarca, and then it becomes lost in the jungle. This road is completely overgrown these days, and you shouldn't attempt to follow it without a map, compass and experience in jungle hiking. There is some very impressive stonework here, indicating that this was an important place. Look for what Bingham called `eye-borders', holes drilled in corners of buildings and edges of walls, which were used for securing thatch roofs (you can see reconstructions of Inca roofs in Machu Picchu). Notice also the characteristic way that the Incas incorporated and emphasized the natural features on which they built –a large outcrop is the unadorned centrepiece of Sayacmama, and the whole structure is built on and emphasizes a prow of rock. Bingham thought that Sayacmarca was a fortified outpost of Machu Picchu, but Fejos wasn't so sure, saying that if the Incas wanted to build fortifications they could do a much more impressive job – he takes Sacsayhuaman as an example. Nevertheless it's unlikely that the site was a tambo (as were the nearby buildings of Concha Marca with their small terrace system): there isn't enough agricultural land for Sayacmarca to be a farming outpost, nor is the stonework impressive enough for it to be a religious centre. No one has come up with a conclusive answer as to what the ruins were. While the function of Sayacmarca isn't clear, the date when it was constructed is more certain. The planning of the site is elaborate; the layout is flexible and responds to the terrain, which makes archaeologists think it was built after the classical period of Inca construction, and the ruins are dated to the last half of the 15th century.